The same Blu-rays found in the Limited Edition Collector's Set. Broadway musicals have been around for more than a century, but only a handful can be considered groundbreaking. 'Show Boat' is one, 'Oklahoma!' another, 'Rent' qualifies as well. Few musicals, however, wield as much impact and emotion, or examine more substantive themes than 'West Side Story,' which took Broadway by storm in 1957 by brilliantly merging song and plot with muscular, balletic choreography that advanced the story, delineated character, and added a thrilling, edgy quality to the production. The 1961 film adaptation, directed by Robert Wise ('The Sound of Music') and Jerome Robbins, faithfully adheres to the stage original, but opens it up further by casting the urban landscape of New York City as an extra and essential character in the drama. This broader, grittier canvas unleashes even more power, allowing the piece to fully blossom and challenging the screen to contain the energy, passion, and electricity that burst forth from each actor and dancer. Even today, there is no musical quite like 'West Side Story,' and the dazzling movie version, which won 10 Academy Awards including Best Picture, enthralls and exhilarates, stimulating our minds and stirring our feelings like virtually no other motion picture in the genre. The stunning opening sequence sets the film's tone and looks as fresh and vital today as it surely did a half century ago. After various aerial shots of Manhattan and the skyscrapers, brownstones, and asphalt pavement that define it, the camera swoops down to ground zero, the concrete jungle where the gang of white teen hooligans known as the Jets patrols their turf, ruling the territory as only adolescent punks can. The personification of cool, the Jets snap their fingers in unison as they intimidate those outside their ranks, their cocky struts seamlessly evolving into balletic dance moves that combine grace and athleticism yet somehow never crack their macho veneer. Soon they encounter members of a rival pack, the Sharks, composed of immigrant Puerto Ricans, and the two groups jockey for supremacy and control through mime, dance, and posturing, taunting and bullying each other until a fracas develops that only the police can bust up. It's an exquisitely choreographed 12-minute scene that immerses us in the location and culture, while laying the groundwork for conflict. With all the bluster and swagger of the roving hoodlums, this sequence grabs our attention and weaves a hypnotic spell that effortlessly sustains itself for the next two-and-a-half hours. 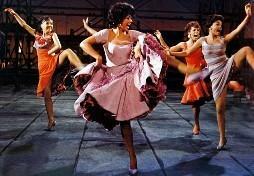 Yes, 'West Side Story' is long, but it never feels that way. The film's pulse is so quick and potent, the time flies. In other musicals, the songs may be entertaining, but they often impede the action. Not here. The remarkable Leonard Bernstein-Stephen Sondheim score, which features such gems as 'Maria,' 'Tonight,' 'Somewhere,' 'America,' 'Something's Coming,' 'I Feel Pretty,' and 'One Hand, One Heart,' consistently propels the story forward, and both Wise and Robbins make sure there's nothing static about the music's presentation. The acrobatic Robbins choreography (at its best in the electrifying 'Cool') adds impeccable flair to many numbers, capturing the ebulliance, wildness, and angst of youth, while the tensions and sense of urgency that pepper the plot hurtle 'West Side Story' toward its shattering climax. An urban updating of Shakespeare's 'Romeo and Juliet,' Ernest Lehman's script (adapted from the original Arthur Laurents book) concentrates on the star-crossed, unblemished, and forbidden love between Tony (Richard Beymer), an Italian New Yorker and one of the founders of the Jets, and Maria (Natalie Wood), a Puerto Rican immigrant and sister of Bernardo (George Chakiris), leader of the Sharks. Tony, who has recently left the Jets to begin building his life, and Maria strive to rise above the prejudice, resentment, and immature turf battles that lead the two gangs headlong toward a violent showdown, but both are powerless to stem the raging hormones and misguided attitudes that fuel each group's xenophobia. Riff (Russ Tamblyn), Tony's best buddy, is determined to preserve the Jets' honor at any cost, while Anita (Rita Moreno), Maria's close friend and Bernardo's lover, tries to balance her affection for her adopted homeland and optimism over the exciting opportunities it offers with the unbreakable bond she shares with her people and time-honored traditions and stringent rules of her culture. It's a recipe for tragedy, and it's beautifully played out with fervor, tenderness, attitude, and, most of all, unbridled energy. 'West Side Story' is one of the first and most meaningful message musicals, preaching tolerance, equality, and anti-violence. Races may clash, the film says, but differences must be embraced, not shunned. Hate is a cancer that sickens and kills, but love heals, and its inherent power is strong enough to break down barriers and bridge gaps between people, ideas, and customs. One look at the rapturous faces of Tony and Maria as their attraction and connection develops, and it's hard to imagine such harmony isn't possible, even as it continues to be thwarted. Their story and that of the warring teen posses resonate so intensely because they reflect the strife and close-mindedness that have defined and consumed the world almost since time began. 'West Side Story' takes a risk by casting two non-singers in the pivotal lead roles, but the gamble pays big dividends. Wood and Beymer fully inhabit their parts, exuding a youthful exuberance and captivating passion that always seems real, and even though we know their songs are dubbed by others, the truth of their work never wavers. Wood especially embodies Maria, adopting a fine Spanish accent and illuminating the screen with an infectious freshness and heartfelt longing whenever she appears. Her chemistry with Beymer is palpable (despite the fact that they supposedly didn't much like each other off camera), and their scenes together crackle with the incendiary fire of first love. Both Moreno and Chakiris earned well-deserved Oscars for their sizzling supporting portrayals (though Chakiris likely won more for his dazzling dancing and smoldering glares than his acting). Wise and Robbins also were honored for their superior directing, which wildly advanced the art and scope of the movie musical. Academy Awards for cinematography, art direction, sound, scoring, editing, and costume design also came the film's way, making it the most lauded musical picture in cinema history. Yet it's the raw emotion - be it jubilant or painful - that's expressed in word, song, dance, and the expressions of the top-flight cast that makes 'West Side Story' so involving and memorable. With rare grace, this exceptional film captures the exuberance of youth and the depth of feeling that infuses souls on the cusp of adulthood. Few love stories feel as real. Few musicals inspire such awe. This one may be 50 years old, but in many ways, it hasn't aged a day. This three-disc combo pack comes attractively packaged in a regular Blu-ray case sheathed in a sleeve that replicates the cover art. Two 50GB dual-layer discs reside inside (one contains the movie and a few extras; the other the bulk of supplements) along with a standard-def DVD that houses a digitally restored version of the film. Video codec is 1080p/AVC MPEG-4 and default audio is DTS-HD Master Audio 7.1. Upon insertion of the disc, the full-motion menu with music immediately pops up; no previews or promos precede it. This version also includes the film's overture, as well as entr'act music. 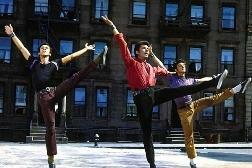 'West Side Story' arrives on Blu-ray mired in a bit of controversy. While I often found the 1080p/AVC MPEG-4 transfer to be breathtaking - and a big step up from the previous DVD - a significant gaffe has rained on this release's parade, sparking mea culpas from Fox and a promise of replacement discs (though no dates or timeframes have been forthcoming). The mistake may seem insignificant to some, but film purists are rightly outraged. The error occurs at the end of the movie's overture; the innovative line pattern over a series of solid-colored panels developed by title master Saul Bass is supposed to dissolve into the skyline of Manhattan without a hitch, but on the Blu-ray there's an odd fadeout that deletes the final green-tinted frame, destroying continuity and diminishing the wow factor of the effect. 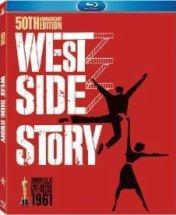 If you own the previous DVD version of 'West Side Story,' you can see how this marvelous concept is supposed to work. Unfortunately, some dingbat at Fox saw fit to monkey with a work of art (maybe to facilitate a more definite chaptering break between the overture and the main feature?). Whatever the motivation, it's a shame such a big boo-boo has to afflict and tarnish what I consider to be a first-rate transfer. Is 'West Side Story' perfect? No. But the film has certainly never looked better than it does in its current high-def incarnation, and there are plenty of jaw-dropping moments of vibrant color, razor-sharp clarity, and spectacular detail. Hues are brighter and truer than they were on the DVD, yet they maintain a winning naturalness. Yellows and purples are especially well rendered, and the tinted glass in Maria's apartment, as well as the shadows it emits during 'Somewhere,' provide lovely accents that enhance the frame without overpowering it. Fleshtones are spot-on and black levels are always solid and deep, with only an occasional instance of crush. Close-ups are gorgeous, even the ones filmed in soft focus; all exhibit marvelous detail and flaunt a hint of dimension that makes the intimate scenes even more immediate and potent. The opening aerial shots of New York are greatly improved, possessing far more detail and clarity than ever before, and such challenging moments as the psychedelic dissolve from the twirling Maria into the gym dance scene and the gauzy, blurred shots that frame Tony and Maria during their initial meeting and later while singing 'Tonight' are handled with aplomb. Patterns are strong, fabrics and textures are well delineated, and background detail is excellent. The heightened clarity occasionally exposes the artificiality of sets and backdrops, but doesn't destroy the urban feel. Grain has been greatly reduced, yet the movie never looks hyper-processed, retaining the feel and texture of celluloid. A bit of aliasing affects some shots - I noticed it most during 'I Have a Love' - but it's faint and not prevalent throughout. Banding is absent, however, and there's no digital noise, even in the darkest scenes. Unfortunately, a few blips keep this transfer from achieving the heights it should have scaled, but it's far from the mess some have purported it to be. Most of the time, I was blown away by it, and for the most part, it does this classic film proud. 'West Side Story' comes equipped with a superb DTS-HD Master Audio 7.1 track that's a big improvement over the previous DVD's Dolby Digital 5.1 audio. But some audiophiles may not be entirely pleased. Reportedly, the film's recently discovered and restored six-track masters, which I believe were used in the movie's recent theatrical roadshow presentation, were passed over for this Blu-ray release in favor of the more cost-friendly four-track masters. Such a decision is disappointing, to be sure, but the 'West Side Story' audio that accompanies this Blu-ray remains top-notch and should thrill most listeners. From the opening strains of the overture, the exceptional quality of this track is immediately apparent. Filled with bright, soaring highs and weighty lows, and distinguished by a crystal clarity, the sound is perfectly mixed and provides a seamless surround feel. The movie may be 50 years old, but the audio sounds like it was recorded yesterday. No surface defects, such as hiss or errant pops, detract from the clean tones, and no distortion ever creeps in. The music enjoys superior dynamic range, from the screaming brass that peppers many numbers to Maria's lilting soprano. The famous 'Tonight Quintet' presents many challenges, as voices compete for prominence and various melodies bounce off each other, but this track handles the five vocal lines with ease, so we can appreciate the musical complexities while still comprehending the lyrics. Dialogue, too, is always well prioritized and easy to understand, and spreads nicely across the front speakers, lending many conversations a nice directional quality. Stereo separation is also strong during the songs and scoring, and solid bass frequencies subtly punch up various scenes without overwhelming them. Details are crisp and distinct, from footsteps on the cement sidewalks to the Jets' finger snapping to the rattling of metal fences. And though surround activity is limited during the dramatic scenes, the music subtly envelops us, creating a cohesive aural environment that draws us deeper into the film. Instead of rueing what might have been, just enjoy this marvelous track, which serves this classic motion picture quite well. This Blu-ray ports over most of the supplements from the special edition DVD, with the exception of the original film intermission and three substantial photo galleries covering production design, storyboards, and behind-the-scenes. The most unfortunate deletion, however, is the 184-page softbound book that came with the DVD Collector's Set, which included the film's complete script, a tribute by screenwriter Ernest Lehman, a timeline, a reproduction of the original lobby brochure, a section devoted to memos and reviews, and dozens of rare photos in color and black-and-white. The book alone is worth keeping the old DVD on the shelf. The Blu-ray box set (not reviewed here) does contain a hardcover tribute book as well as collectible postcards and a music CD of 'West Side Story' covers from a number of well-known artists, but that swag can't compete with the screenplay book, so be sure to keep that volume if you upgrade. Documentary: "West Side Memories" (SD, 56 minutes) – This comprehensive and involving 2003 documentary features reminiscences from many key players in both the stage and film versions of 'West Side Story,' including Robert Wise, Rita Moreno, Richard Beymer, Russ Tamblyn, Arthur Laurents, Hal Prince, and Stephen Sondheim. (There are also archival recollections from director-choreographer Jerome Robbins.) The piece takes us inside the rehearsals and filming through rare behind-the-scenes stills and on-set home-movie footage, and we learn from the principals about the grueling run-throughs, the tensions between Wise and Robbins and their differing directorial styles, the perfectionism of Robbins that ultimately led to his dismissal from the production before shooting concluded, the frosty personal relationship between Wood and Beymer, and how many of the performers did not do their own singing. (Rare original vocal tracks from Wood and Tamblyn allow us to hear how differently some songs might have sounded.) Any aficionado of 'West Side Story' will appreciate this thoughtful and well-produced tribute. Music Machine – This handy jukebox feature allows you to directly access all of the film's musical numbers, either individually or through a "play all" function. Storyboard to Film Comparison Montage (SD, 5 minutes)– A look at how closely the storyboard drawings mirror the finished shots in the movie, this smooth montage is set to instrumentals from the soundtrack and includes a couple of sketches of a proposed 'Somewhere' ballet that was never realized. Theatrical Trailers (SD, 14 minutes) – Three traditional trailers and one animated preview are included. 'West Side Story' comes to Blu-ray at last, and though a couple of transfer glitches put a damper on its coming out party, this is still an impressive release that will dazzle diehard fans and delight those who have yet to experience this exhilarating Oscar-winning classic. An iconic musical that brims with breathtaking choreography and features one of the most beloved scores in history, 'West Side Story' still packs a hefty emotional punch and makes potent statements about prejudice and violence. Performances across the board remain relevant and affecting, and the direction looks as fresh and vital today as it surely did 50 years ago. New supplements add luster to this presentation, which includes superior video and audio that makes this time-honored tale come alive like never before. 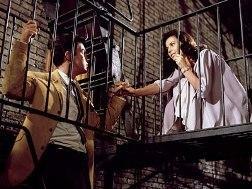 If anyone tells you musicals aren't cool, show them 'West Side Story.' Its brilliance speaks for itself.